Dr Stephen Strange’s (Benedict Cumberbatch) life changes after a car accident robs him of the use of his hands. When traditional medicine fails him, he looks for healing, and hope, in a mysterious enclave. He quickly learns that the enclave is at the front line of a battle against unseen dark forces bent on destroying reality. Before long, Strange is forced to choose between his life of fortune and status or leave it all behind to defend the world as the most powerful sorcerer in existence. Finally, I am able to write the review of Doctor Strange. I’ve watched the film the first day it was released in the cinema. So, I went straight to the cinema after work, not caring how late it would be and how tired I was. I was so excited and wanting to watch Doctor Stranger ever since the teaser trailer was released. I guess Benedict Cumberbatch is the first reason why I am so interested in this film. Anyway, let me tell you, Doctor Strange is the strangest Marvel film I’ve ever seen yet the most interesting Marvel film thus far. 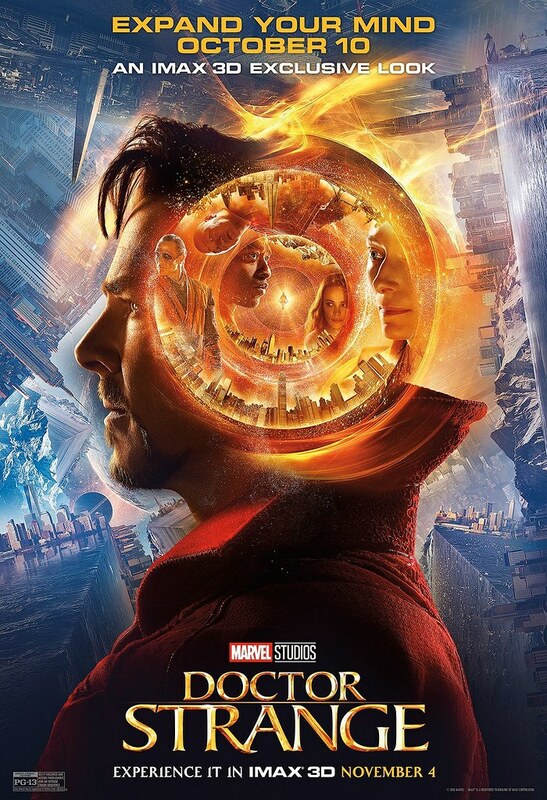 I always think Iron Man 3 (2013) is the best Marvel film until I watched Doctor Strange. I think Iron Man 3 is really really cool and awesome with all the super awesome technologies, while Doctor Strange looks so cool with its magic. Coincidentally, both films starred my favourite actors, which are Robert Downey Jr. and Benedict Cumberbatch. Thinking about my favourite actors, Tom Hiddleston and Hugh Jackman also played in Marvel films. Tom Hiddleston played the role of Loki in Thor (2011), The Avengers (2012), and Thor: The Dark World (2013), whereas Hugh Jackman played the role of Logan a.k.a. Wolverine in eight out of nine X-Men film series, including the last X-Men film, X-Men: Apocalypse (2016). What a bloody coincidence, eh? Anyway, anyway, Doctor Strange is not like any other Marvel films. I never read the comic, so I can’t compare its film with the comic. But I do know this. Doctor Strange is really awesome. It is weird but it’s a good weird. What I love about this film is the humour. It is so Cumberbatch. He always plays the smart guy with no sense of humour yet somehow that’s what made him very funny. He is already funny without effort, without even trying to be funny at all. His straight face that shows no expression of being funny is what made everything funnier. Seriously, I laugh many times when I watched this film. It is hilarious. It’s not the type of hilarious that makes your stomach hurt or your eyes tear, but it is the type of hilarious that makes you more enjoying the film. I think the ‘joke’ is even better than Deadpool (2016). I think Deadpool is funny, but if I have to choose, Doctor Strange has better jokes than Deadpool. Even the story is way better than Deadpool. As for the visual effects, don’t even start to ask. It’s one of the best visual effects I’ve ever seen. I think Doctor Strange really has the best visual effect from Marvel Studios. Although there were so many controversies, I think Tilda Swinton did a great job as Ancient One. I know there are many people who don’t like the idea of the Ancient One as a woman, but I think Tilda Swinton really pulled the character off. She is a great actress after all. I think in a matter of the cast, Doctor Strange really has a great cast. How come you say no when the cast is full with Oscars nominees such as Benedict Cumberbatch, Chiwetel Ejiofor, and Rachel McAdams. Even Tilda Swinton is an Oscar-winning actress. It’s a great cast, right? Benedict Cumberbatch’s British accent has fully gone, replaced by his American accent, a skill that is required when you’re an actor or actress, though not everyone can pull it off. Benedict Cumberbatch did it fluently anyway. I just love saying the name. Benedict Cumberbatch. Even his name is awesome! The acting skills? No questions there either. He’s just superb. After playing the role of Sherlock Holmes in Sherlock TV series, The Imitation Game (2014) and Star Trek Into Darkness (2013), now Benedict Cumberbatch is back and playing another genius person. I think it’s his thread. He really has the look, don’t you think? And every time, he always plays the genius guy with no sense of humour yet somehow that’s what made him funny. Every time—except in Star Trek of course. I won’t say it’s too boring, too monotone, and so on, because I think every time he did it, he really entertained me. So I don’t mind if he keeps playing that type of role anyway. Benedict Cumberbatch really suits that kind of role. Sherlock, Star Trek, and Marvel Universe. He really is fantastic. Since I love and do believe in magic, I really like Doctor Strange’s story. I know the plot story is a bit predictable but I like the magic they’ve put in the story. Lingering around magic, this film is unlike any other Marvel films—well, perhaps Thor because Loki can do tricks. I guess that is why Loki is my favourite villain. I love him more than Thor. Not because he is played by Tom Hiddleston—okay, part of it because of that reason—but because Loki is funnier and more charming than Thor, who is more serious. Loki can also do magic tricks. That’s why I think he is more awesome. Okay, I am starting to estrange the topic again, so let’s get back on track. So, Doctor Strange is about magic and dimensions—a multiverse. It is strange to think there’s this kind of story in Marvel universe. Usually, it’s about biology, science, fightings alien, and such, and then suddenly there’s this magic. I never read Marvel comics before so I never really know about Doctor Strange. Now I know and I like him. A lot. If before I always choose Iron Man as my favourite Marvel superhero, now I can’t even choose whether I like Iron Man more or Doctor Strange more. Both of them are just awesome. Doctor Strange is just superb! I think Doctor Strange is one of the best film this year, if not, one of the best film from Marvel. It is different from any Marvel films before and the strangest one as well. The name really precedes it. However, it is a good strange, an awesome strange indeed. With all those magic and multiverse and everything, Doctor Strange is really a great film that worth to watch. No, it’s not worth, it’s a must-watch film! I give Doctor Strange 9 out of 10 stars.